For better or worse, Willow Pond Kitchen in Concord, Mass., left me with some unforgettable memories. I really didn't care at all for the cow manure stench across the street, the sometimes surly service, a fight at the bar I witnessed, and, perhaps, the worst pizza in the world, but all that was easy to overlook. Willow Pond Kitchen was a one-of-a-kind restaurant -- a dive with stuffed moose on the wall and catfish and frog legs on the menu. What many people came here for were the pitchers of beer, boiled lobster and huge servings of oysters -- all at rock-bottom prices. The onion rings were also amazing! I also loved Willow Pond Kitchen's unlikely presence in this affluent town -- sort of like Rodney Dangerfield's party boat intruding into the refined Judge Snail's sailing territory in the movie Caddyshack. With no pretension, lines sometimes out the door and a long-time presence, Willow Pond Kitchen seemed like it would last forever -- but, of course, it didn't. The National Park Service created a Revolutionary War historical marker there, thus resulting in having the Willow Pond building taken down in 1999. So, if you know of any other local restaurants with a cow manure stench across the street, sometimes surly service, the worst pizza in the world, stuffed moose on the wall, and catfish and frog legs on the menu, please let me know. I miss the Willow Pond Kitchen dearly. 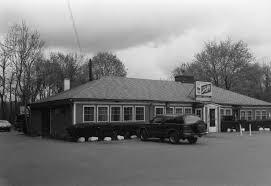 I was born in 1961 and we went there frequently throughout the early 70s. Spaghetti and meatballs… Never got anything different! Mom always got steamers. Are used to sit there and or at all those stuffed/ taxidermy animals around the walls. 94 WCGY, "The Rock Garden"
Nick's Beef and Beer House in Cambridge, Mass. Fond Memories of Hoffman News in Arlington, Mass.